There will likely be a lot more of this in store. 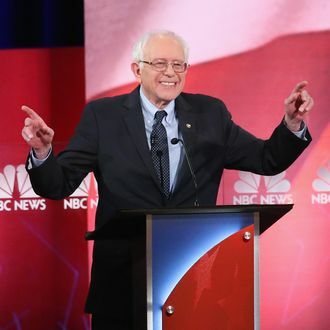 MSNBC announced on Sunday that it will definitely be holding an official Democratic debate this Thursday, February 4, confirming what had previously been an unsanctioned event. The Democratic National Committee will most likely sanction additional debates as well, following months of refusals to consider more of the events, or to acknowledge the fact that more people watch television on weeknights than weekends. Thursday’s New Hampshire debate will be moderated by Chuck Todd and Rachel Maddow, and all three Democratic candidates are expected to attend (though it’s not yet clear if anyone will let last-place candidate Martin O’Malley speak unless spoken to). Earlier this weekend, BuzzFeed News reported that the campaigns of Democratic presidential front-runners Hillary Clinton and Bernie Sanders had agreed to participate in four more debates, so long as they were sanctioned by the DNC. Now the New York Times is reporting that the DNC will meet with the candidates’ campaigns on Tuesday to determine if, when, and where those debates can be scheduled, most likely in March, April, and May. Though details have yet to be determined, a Sanders campaign source told BuzzFeed that “once dates and cities are locked down, we are looking forward to four additional debates,” a sentiment echoed by the Clinton campaign. The Sanders campaign is also trying to make sure that any new debates will be scheduled to happen before the key remaining contests that award the most delegates. The previously scheduled debates on February 11 and March 9, also both on weeknights, will still proceed as planned. There will also be a three-hour CNN Democratic town hall this Wednesday evening in New Hampshire. The DNC and its chairperson, Debbie Wasserman Schultz, have been heavily criticized over the reduced number and bizarre scheduling of the cycle’s Democratic debates thus far, with some of the events falling on weekends, as opposed to prime-time weeknights like the Republican debates have been scheduled. Some have accused Schultz and the DNC of designing the debate schedule to give Clinton an advantage, though they have regularly rejected that assumption, and Schultz has maintained the somewhat dubious claim that the schedule was instead set to “maximize” the candidates’ exposure.